Let the cosmopolitan vibe fly high wearing these brown coloured formal shoes by Arrow. Offering optimum traction on the wet or dry floor, the TPR (thermoplastic rubber) sole complements the sleek design of this pair of formal shoes. 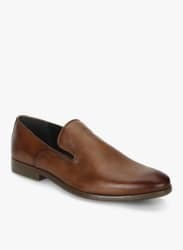 Team these up with semi-formal trousers and a crisp white shirt to look dapper.